These are so worth the effort. And what's more, they're so rich that you won't really want to (or be able to, for that matter) eat more than one. I did these based on the recipe at Have Cake, Will Travel, but I've made enough modifications (mine are lighter on the peanut butter and heavy on the chocolate) that I thought I'd just share the recipe here. -Melt the chocolate chips in a glass container in the microwave for 30 seconds at a time, stirring well in between. You'll want it to be smooth and sort of thick, not too runny. -Add the tablespoon of peanut butter and salt. Stir. -I found that using individual silicon cups in a muffin tin works perfectly for this, but use paper cups if that's all you have. -Using a half tablespoon measure, scoop chocolate into each cup and smooth up the side about a third of the way. This part can seem really messy, but don't panic, they'll still be pretty. -Pop in the fridge for 10 minutes or so. 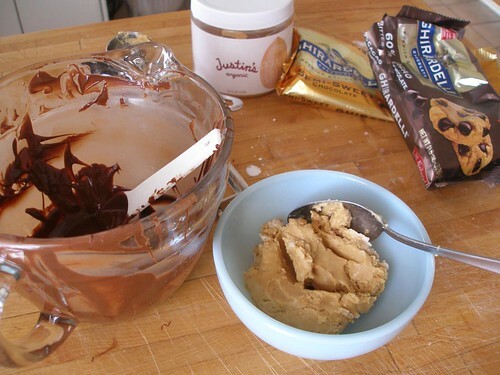 -Mix up the peanut butter, sugar and salt. I've found that these work much better if this mixture is fairly stiff at room temperature. -When the chocolate is set, add about a teaspoon or so of the peanut butter mixture to each cup, smoothing down with the back of a clean spoon. -Put the container with the chocolate in it back in the microwave for 10 to 30 seconds. You want it to be thin and drizzeley now. -Using the same half tablespoon measure as before, add more of the chocolate mixture. 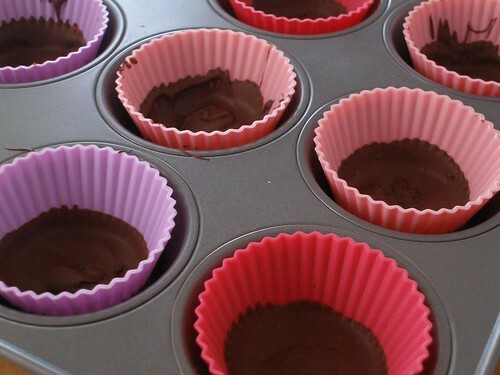 -When all cups have the top layer of chocolate, feel free to bang the pan up and down on the counter. It will smooth and settle all the chocolate. Pop any air bubbles with a toothpick if you're feeling overwhelmed by OCD. -Put it back in the fridge until set. -Pop them out of the silicon cups and give to your favorite people. Oh my dear lord those look good. And not at all difficult. Wow. Yum. Too bad I didn't buy silicone baking cups in my huge trip to the bix bog craft store yesterday. I feel like those peanut butter cups are looking right at me. 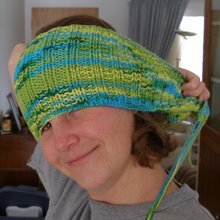 I am definitely going to make this one. 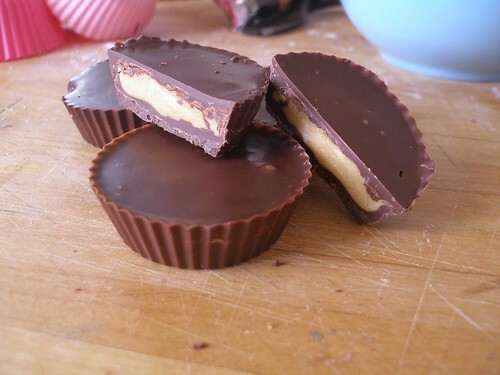 I have always loved peanut butter cups. But this is more lovable since it is homemade. Thank you! I crave peanut buttercups but can't easily get them here in the UK - by which I mean that I once found them at a newsagents at Paddington Station! It never occurred to me to make at home. I will be trying this recipe out. Ta!